For the third straight year, Miami Dade College Foundation raised more than $1 million at its sold out 2019 Alumni Hall of Fame Induction Ceremony on Tuesday, April 9th. More than 1,000 guests attended the celebration at the Hilton Miami Downtown and nearly 90 corporations and individuals sponsored the event.The event raised a total of $1,051,395, which will support scholarships for current and future MDC students. See photos. 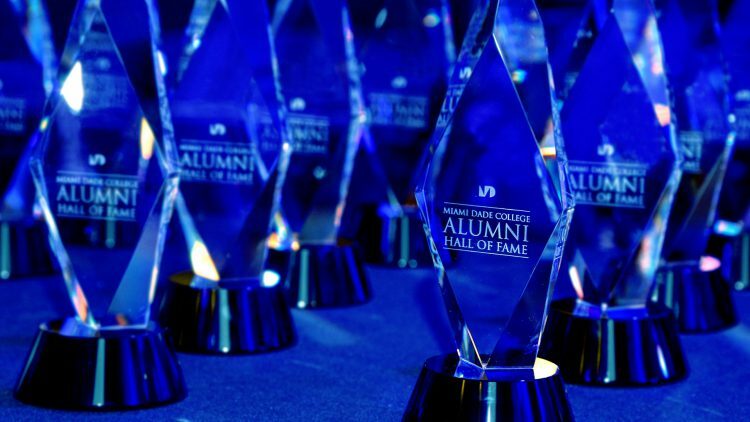 The Miami Dade College Alumni Hall of Fame celebrates the achievements of outstanding MDC alumni who are the civic and business leaders of our community, while raising essential funds to support student scholarships for the next generation of Miami’s leaders. Honorees are recognized for their career accomplishments and positive impact on the community and the College. MDC has inducted 376 alumni to the Hall of Fame since the program was created in 2003.Now in its 17th year, the MDC Alumni Hall of Fame recognizes a group of honorees each year for their career accomplishments, service and positive impact on the community and nation. The event is the largest Miami Dade College Foundation fundraiser of the year, benefitting student scholarships for the next generation of leaders. MDC salutes the new group of distinguished alumni. A Cuban immigrant who came to Miami at the age of 14, Joseph “Pepe” Badia is the President of the worldwide company Badía Spices. The company began with Badia’s father in 1967, and Badia got his start working for the company in 1970 by doing local sales to area bodegas. Soon, Badia grew the business with sales to larger chain stores. Badía Spices can now be found in 90 nations worldwide, while employing more than 300 people. For years, Badia has generously supported a variety of causes in the community, including scholarships for students at Miami Dade College. In 2017, he was honored with Philanthropy Miami’s Donor Next Door award. Desmond Meade, who was formerly homeless, overcame many obstacles to eventually become the Executive Director of the Florida Rights Restoration Coalition and Chair of Floridians for a Fair Democracy. Meade has orchestrated the reorganization and incorporation of a coalition comprising over 70 state and national organizations and individuals, and led the group to a historic victory in 2018 with the successful passage of Amendment 4, a grassroots citizen’s initiative which restored voting rights to over 1.4 million Floridians with past felony convictions. Meade is presently leading efforts to empower and civically re-engage local communities across the state, and to reshape local, state, and national criminal justice policies. Dr. Claudio Miro is a Dentist and President of Miro Dental Centers, which has been treating patients in Miami-Dade and Broward Counties for more than 30 years. Dr. Miro received his Doctor of Dentistry at Central East University in the Dominican Republic. He began his private practice career in 1988 dedicating his practice to surgical and prosthetic implant reconstruction. He has taught nationally and internationally on various topics related to dental implants. In addition, he serves as chairman of the Florida Board of Dentistry and on the boards of the Robert Morgan Dental Implant Clinic and the Larkin Community Hospital. Dr. David K. Moore serves as Assistant Superintendent for Miami-Dade County Public Schools, the fourth largest school district in the nation. Since 2014, Dr. Moore has led the Division of Academic Support, which encompasses district-wide school improvement, student services, and the Education Transformation Office. Dr. Moore was instrumental in redesigning each area under his supervision, and under his leadership, Miami-Dade County Public Schools reduced the percentage of schools rated below a “C” from 83% in 2015 to 5% in 2018. Dr. Moore’s work in the school district spans more than 20 years, starting as a teacher at South Dade Senior High School and working in a variety of roles across the district including Counselor, Assistant Principal, Principal, and Administrative Director. He received a Doctorate of Education from Nova Southeastern University and a master’s in guidance and counseling from St. Thomas University. Maximo “Max” Fajardo has more than 45 years of design and construction experience in the transportation infrastructure market, specifically in the areas of aviation, seaports and other related facilities. He has specialized in program and construction management, engineering, procurement, operations, maintenance and business development. During his career, he has worked in both the private and public sectors, including 21 years at the Miami-Dade Aviation Department. Most recently, he served as T.Y. Lin International’s Project Manager for the award-winning Cinta Costera Phase 3 project in Panama City, Republic of Panama, Engineering News Record’s International Project of the Year for 2015. Esteban Formoso currently serves as Senior Vice President of Wealth Management at Morgan Stanley at its Coral Gables office, a position he has held since 2011. Prior, he worked as Senior Vice President for UBS for 10 years, where he generated $1.24 million in revenue a year and managed $83 million in assets. He received a bachelor’s degree in industrial engineering and finance from University of Florida. Boris Sanchez is a CNN White House Correspondent based in Washington D.C. Sanchez joined CNN in June 2015 as a New York-based correspondent and relocated to Miami a year later. Sanchez has covered numerous breaking news events, which includes being one of the first reporters on the scene at both the Fort Lauderdale Airport shooting (2017) and the Orlando Pulse Nightclub massacre (2016). His reporting during violent unrest and riots following the shooting of an African-American man by police in Charlotte, N.C. (2016) helped CNN win an Edward R. Murrow Award for breaking news coverage. James Jackson Hutson, Jr., M.D. Dr. James Jackson Hutson, Jr. practices Orthopedic Trauma Reconstruction Surgery at the University of Miami Ryder Trauma Center at Jackson Memorial Hospital, which was founded by his great grandfather, Dr. James M. Jackson. Dr. Hutson is an Associate Clinical Professor in the Department of Orthopedic Surgery at the UM Miller School of Medicine, and he has been a member of the faculty for 20 years. He graduated from the University of Florida School of Medicine and completed orthopedic residency at Jackson Memorial/University of Miami. Dr. Hutson serves on the Editorial Board of the Journal of Orthopedic Trauma, and he is a member of the American Academy of Orthopedic Surgery, Orthopedic Trauma Association and the Limb Lengthening and Reconstruction Society. Dr. Angie McAllister is a leader in personalized learning and analytics, and helps to lead ACT’s efforts in next-generation assessment and learning technologies in her current role as Senior Vice President of Research and Development. She has spent more than a quarter century in the classroom—as an elementary and middle school teacher in South Florida, urban Maryland, Japan, and England. She also served as a principal in Georgia, and as an adjunct professor at a number of colleges and universities. Dr. McAllister has earned several patents, including for technology that adapts digital learning experiences to the real-time needs of students. She earned her doctorate in educational leadership from Capella University, and her B.S. in elementary and early childhood education from Florida International University. Frances Civilette Downs, Ph.D., R.N. With more than 20 years of clinical and regulatory experience, Dr. Frances Civilette Downs leads, directs and coordinates a multi-disciplinary team in Preventive Ethics initiatives across service lines at the Miami VA Healthcare system. Dr. Downs also mentors graduate nursing students for research practicums, including application of qualitative and quantitative research methods for health and preventive ethics projects. She is a member of the Miami VA Geriatric Research Education Clinical Center Advisory Board and of the Ethics Consult Committee. Dr. Downs received a B.S.N from University of Miami, and a M.S.N in Nursing Education and Ph.D. from Barry University. For the past 15 years, JennyLee Molina’s communications and public relations work has helped shape brands, placing them on the leading edge of popular culture. As the founder of the boutique PR agency JLPR, Molina has represented clients in the areas of art, food, beverage, lifestyle, health, wellness, entertainment, and nonprofit. Molina placed Miami on the social media map as the founder of 3:05 Cafecito, a social media campaign that proclaimed Miami’s area code as the official time for a coffee break. During Social Media Week 2013, her efforts garnered her recognition as the most influential Twitter user in the United States and the second most influential Twitter influencer globally. She was recently awarded BizBash’s Award for PR Professional of the Year. Alexander E. Rolle, Jr. currently serves as the Chief of Police for the Homestead Police Department, a position he has held for two decades. He began working at the police department in 1980. Chief Rolle is committed to serving his community and is actively engaged in local issues, from addressing inequality to improving the justice system. Founded in 1965, Miami Dade College Foundation raises essential private funds to support scholarships, academic programs and support services so MDC students have the opportunity to pursue their dreams. MDC Foundation also supports world-class arts and cultural programming at MDC that enriches the community. In 2017-2018, MDC Foundation distributed nearly $9.5 million to benefit the students and programs of MDC. Known as Democracy’s College, MDC changes lives through accessible, high-quality teaching and learning experiences that prepare students for tomorrow’s workforce. Miami Dade College is the largest degree-granting institution in the nation.